As smartphone and mobile web usage continues to soar, users are spending more and more time on social networks like Facebook ( ) and Twitter ( ). 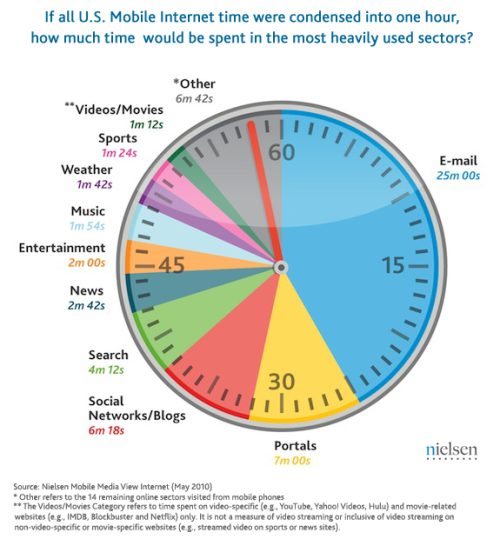 But how is the mobile web impacting the oldest form of Internet ( ) communication, e-mail? For desktop Internet users, e-mail may be playing second-fiddle to the likes of Facebook and social games like FarmVille, but on mobile devices, e-mail is still number one. In fact, new research from The Nielsen Company suggests that e-mail represents 41.6% of mobile Internet time for users in the United States.